Costa Calma holidays are a beach lovers's delight. Located on the south east coast of Fuerteventura this resort has expanded from the original village, along the beach which is possibly the best on the island. Costa Calma is well named as it is a quiet resort ideal for those wishing to relax beneath cloudless skies. If you are feeling more energetic, there are plenty of activities and tourist attractions to fill your days. 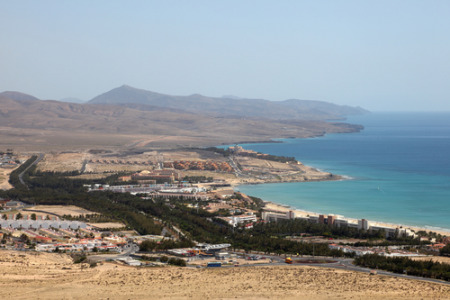 With low cost airlines flying from many regional airports, travel to Fuerteventura has never been cheaper. The island has a very pleasant climate in both the summer and the winter and you can enjoy winter sun without having to take a long haul flight. This is a great advantage when travelling with young families. And young families flock to Costa Calma to take advantage of the soft, sun-bleached sand and the safe bathing for youngsters. Accommodation is of a high standard with all-inclusive hotels and apartments. If you are travelling with children, the all-inclusive option, which at first sight may appear to be expensive, may actually help you to keep within budget. With ever hungry and thirsty offspring, the cost of snacks and drinks can soon mount up. Eateries provide every sort of cuisine from traditional dishes to gourmet dining. In addition, fast foods are available. Shopping in the resort is fairly limited but many more goods are found in the shops of neighbouring Jandia. Nightlife is a relaxed affair reflecting Costa Calma's popularity with families and couples. Since the island has many tourist attractions, in order to get the best out of your holiday, car hire is recommended. If you are looking for a cheap Costa Calma holiday you have chosen the right website. As a price comparison site we can search for holidays from almost three dozen travel companies. With such competition, you can be sure of a good deal. Our easy to use search facility will lead you the company offering the cheap Costa Calma holiday that offers the best value. Make your phone call today and you can soon be on your way.